Most toss jugglers don’t know much about antipodism, the art of foot juggling. While they both share the term “juggling,” there isn’t much over overlap in skill sets. Some of the best toss jugglers don’t use their feet at all and some of the best foot jugglers don’t know how to cascade three balls. Obviously, this isn’t universal. Many toss jugglers incorporate club kick ups, foot catches with balls, and scorpion kicks. Three of the best jugglers currently doing club kick ups are Shay Wapniaz, Gena Shvartsman Cristiani and Brian O’Connell. Below are videos of them each showcasing their work. Another amazing club kick up expert is Manuel Alvarez. Watch his amazing kick up work below. One of the best toss jugglers with foot catches and tosses is Kentaro Tsuchiaya of Japan. Below is a video of him demonstrating these skills. Note that Kentaro does two balls with one foot, which will be discussed later in this article. Many jugglers do blind kicks / scorpion kicks with balls, rings, or clubs. Below is a video of Manuel Rospigliosi demonstrating the basic version of the club blind kick. Just as many toss jugglers incorporate footwork into their routines, antipodists often use their hands and even do standard toss juggling while using their feet. Below is Nata Galkina integrating toss and foot juggling quite well. Another amazing integration of using the hands and feet together is done by Laura Von Bongard. Click here to see her juggle six large balls using her hands, feet, and floor bounces. Click here to see Valeriya Markova demonstrating toss juggling while doing independent foot juggling. While the tricks and routines discussed above are certainly remarkable, they aren’t the exact topic of this article. The topic at hand is the fairly new skill of toss juggling solely with the feet. The earliest example I can find of this being done was by Leo Bassi in the late 1940s and early 1950s. Several sources mention him being able to cascade three balls with his feet while doing the same with this hands. An illustration by Joe Marsh of Bassi doing this appeared in the 1950 Juggler’s Bulletin Annual and appears below. Today there are a number of jugglers who do some amazing toss juggling with their feet. The first juggler I saw who could cascade three balls / beanbags / footbags with his feet was Peter Irish. Below is video of him showing off some of his foot toss juggling skills in performance. I asked Peter Irish how he got started doing foot toss juggling. Here’s what he had to say: “I started my juggling career by learning to manipulate objects with my feet first, practicing the art of footbag (hacky sack) to the point of winning world championships in the game before I even started to juggle with my hands. When I began working with my hands I immediately knew I could combine the hands and feet in juggling. I wondered if it was possible to juggle cascades on the feet and hands simultaneously. This idea fueled years of creative exploration and creation of my own style of juggling. The most important factor of creating this style was the mastery of the feet first…becoming as comfortable with my foot catches as I am catching things with my hands. Also, props are important….the right shoes and juggling balls help. Also, for me, wanting to be creative and do something different has always been my interest.” Peter recently submitted a record to the Guinness World Record organization of 58 catches of three balls with his feet. He’s awaiting approval of the record. Another performer that combines his talents as a footbagger and juggler is 2010 IJA Individuals Champion Jorden Moir of Canada. Watch some of Jorden’s amazing foot toss juggling in the following practice video. He even flashes seven balls with this hands while cascading three with his feet. The “numbers champion” of foot toss juggling is Stanislav Vysotskyi. In the video below you can see him juggle up to four balls using just one foot! A different approach to foot toss juggling with balls is done by Timur Kaibjanov. He sits while juggling with his feet and uses shoes with small bowl-like attachments in which he catches the balls. Watch his act below. 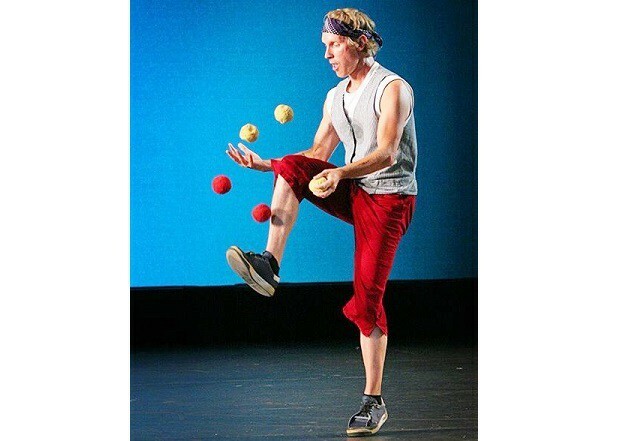 Click here to see Timur juggle four balls with his feet and four balls with his hands. Perhaps the most unique foot toss juggling is done by Olga Gevorkyan, who juggles three large hoops with just her feet, spinning each hoop once on the foot between each catch and release. Olga also performs an extremely complicated trick using all four of her limbs that includes toss juggling with one hand. You can see both of these tricks in the video below. This same technique of juggling three hoops with the feet is also done by Antonina Zadonskaya. To the best of my knowledge, the only toss juggling of clubs done with just the feet, other than the two on one foot shown in Brian O’Connell above, is Anthony Gatto’s ability to do the same. Below is an amazing video of Anthony showcasing many club kick up variations and concluding with a brief juggle of two clubs on one foot. As you can see, expanding catching and tossing to all four limbs creates a myriad of possibilities not achievable with just the hands. This area of juggling has barely been explored. I’m confident that the coming years will see many more jugglers delving into foot toss juggling. Maybe someone will soon cascade three clubs using just his or her feet!